Islamabad, in which Benazir Bhutto twice took oath as Prime Minister, had during her exile moved firmly into the U.S. orbit of influence. It looked nothing like the provincial capital I had visited in 1991 or even 2001. Instead by toward the end of the decade it had become a cosmopolitan city where big money and an entrenched mafia had transformed it into a U.S. outpost for Afghanistan. Today the Islamabad highway – which connects to the airport – has signs to Srinagar, Muzzafarabad, Lahore and Murree, anywhere but local destinations. The nouveau riche display their boorish mentality in high-speed dark tinted Mercedes cars, flashing lights to move drivers off the roads. Middle Eastern and foreign capital has poured in and influenced the architecture of banks, gas stations and mosques. Five Star hotels, amongst them the Marriot Hotel, are barricaded like massive fortresses. Islamabad is the epicenter for CIA-ISI partnerships and betrayals in a growing battle for control over Afghanistan. As in the days of the Cold War, the U.S. and NATO presence in Afghanistan has once again strengthened the Pakistan military. Like the Margalla hills, the war in Afghanistan casts its shadow over the National Assembly and Senate – which today sit amid a formidable ring of security check posts. What has not changed is the presence of poor people, which Islamabad attempts to brush under the carpet. Behind the veneer of modernity, it is impossible not to notice common people at bus and wagon stops and impoverished way side restaurants, bearded men in loose-fitting shalwar kameez or the few numbers of women in public. The feudal culture is evident in the peasants who trek from their villages to Islamabad, where they end up as domestic servants. Islamabad – with its filthy rich and powerful – along with its poorer twin garrison city of Rawalpindi, was the perfect setting for the mafia to finally get Benazir Bhutto, who had cheated death from the day she landed in Pakistan. By publicly denouncing Musharraf, Benazir had simultaneously challenged the intelligence agencies and the Islamic militants secretly coddled by them for strategic purposes in the region. The prospects of a Bhutto rousing the masses riled the military, even as the militants were strongly opposed to being ruled by a woman. 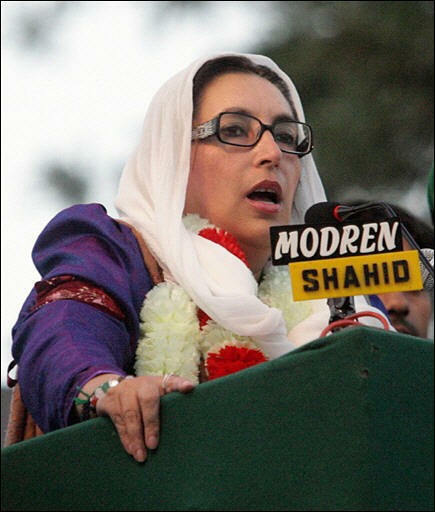 That fateful day – Dec 27, 2007 – Benazir drove to Liaquat Bagh, Rawalpindi in a white Land Cruiser packed with eight people. They included the driver Javed ur Rehman and a retired Major SSP Imtiaz Hussain. Benazir sat behind them between Sindh’s leading feudal Makhdoom Amin Fahim and close companion Naheed Khan. The third tier consisted of Naheed’s husband Safdar Abbasi and security guard, Khalid Shahanshah. Benazir’s personal attendant, Razak Mirani, occupied the last seat. Eye-witnesses say that security was “very tight” that day at Liaquat Bagh, Rawalpindi. The rally participants were scanned at the rally entrance, even while armed police men stood on rooftops. The crowd was small and oddly enough, seated on chairs located a considerable distance from the stage. While Benazir spoke, news filtered in that Nawaz Sharif’s procession had been attacked in Islamabad. It created a commotion in the media stand and some of the journalists began to leave the rally. However, Benazir went on speaking. Although PPP guards were deputed to guard Benazir, subsequent videos indicate her internal security was compromised. You Tube videos show that Benazir’s party member, Khalid Shahanshah gesticulated to “would be” assassins from the stage – a finger sliding across his throat amd eyes rolled toward Benazir. Shahanshah was later killed by unidentified assailants in Karachi and the PPP failed to investigate his murder. After her speech Benazir walked on the stair case behind the stage and got into her Land Cruiser – parked within municipal precincts. Eye-witnesses said that police had, by then, secured the rally and did not let anyone leave. Senator Safdar Abbasi, who was with Benazir till her last moment, recalls that she was “very pleased” with the reception she had received. There was a sense of abandon in her as she stepped into her white Land Cruiser and hugged Abbasi’s wife, Naheed Khan – Benazir’s life long protector and companion. Their bomb proof Cruiser made a right turn on Liaquat road and then on College road where some two hundred or so PPP supporters raced along, raising slogans. Subsequent video footage shows that among them was the killer – a sophisticated looking young man in dark glasses, white shirt and coat, with a gun and explosives. The video shows another man wearing a white hood stood behind him, believed to be his cover suicide bomber. At that stage, the black Mercedes which carried Benazir’s chief security officer, Rehman Malik – who had served Benazir and Asif well while they lived in exile – was nowhere to be seen. It was a departure from the normal drill, where Benazir’s vehicle normally followed Malik’s vehicle. Traveling with Malik was a former Musharraf loyalist, the retired Lt-Gen. Tauqir Zia – who had joined the PPP only days before – and party men, Babar Awan and Farhatullah Babar. Blissfully unaware of the dangers lurking around and anxious to invigorate crowd support ahead of her forthcoming election, Benazir decided to respond to the PPP youth who ran along side her white land cruiser while they cried “Wazir-i-Azam – Benazir” (Prime Minister – Benazir). Acting on Benazir’s wishes, Safdar took hold of the megaphone from inside the cruiser and bellowed out the catchy slogan, “Nara-i- Nara-i Nara-i Bhutto… (crying, crying, crying Bhutto)” to which the crowd frantically responded “Jeay Jeay Jeay Bhutto.” That was the cue for a smiling Benazir to stand up from the sunroof of the vehicle and wave to the crowd. The frenzied crowd had by now forced the land cruiser to a crawl, giving the sharpshooter the opportunity to aim at Benazir’s head. Suddenly, shots rang out. Seconds later, Benazir had slumped inside the cruiser, and her blood had spilled all over Naheed’s lap. The shots came from the left side, but the bullets pierced and left wounds on the right side of her head. “She was instantly dead,” Abbasi claims. Immediately thereafter, he says there was a loud explosion that cracked the windows of the vehicle and caused the tires to lose air. Video footage later showed that the sharp shooter had fired three shots, looked down and detonated his explosives. Dozens of others were killed as well, at least 15 of whom were disfigured without recognition. This entry was posted in Excerpts, Terrorism. Bookmark the permalink. This is exactly something I have to find more information about, appreciation for the publish.